Sure, it's great to write about your work. I always encourage offering glimpses of works in progress. But, your blog can't be just about your latest pieces. 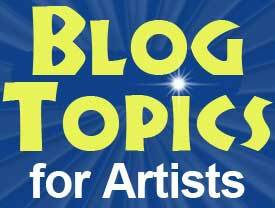 Readers have made my first post with suggested blogging topics for artists, titled, "52 Blog Topics for Artists - Get Started Now!" one of the most popular among the nearly 500 posts on this blog. Why licensing of my art helps the original art's value. Don't Miss Another Issue! CLICK HERE to get regular updates to Art Print Issues emailed to you. If you have not setup a blog yet, or are unhappy with your current blog software, consider using WordPress. It has become the de facto blogging software for small businesses, and also is widely used as a website builder. If you want to learn how to build a website or blog with WordPress, get this 40+ WordPress Video Training Tutorial series for only $9.95. The videos are short, concise and well-produced. The make for great training if you hire someone to help you with your WordPress blog or website. My friend, Jason Horejs, owner of Xanadu Gallery, broadcast "Blogging Tips for Artists | Art Business - Art Marketing Podcast" last May. Use this link to download the podcast. There are valuable reasons to blog, and numerous ways to go about blogging. We covered as many as possible in our podcast. You can find numerous posts I have published on blogging for artists. Use the link to find a custom search list of posts about blogging for aritsts on Art Print Issues. Successful Art Careers | Networking | Part Ten A somewhat ugly truth about your art career success is that it often is less about what you know, and more about whom you know that matters.